"When I Grow Up" - Part 3: "Sibling Rivalry"
We open with a prologue once again, as Kid Amazo's family, better known as the Super Duffy's, take down Titano - The giant cyborg gorilla. These events take place a few months ago. 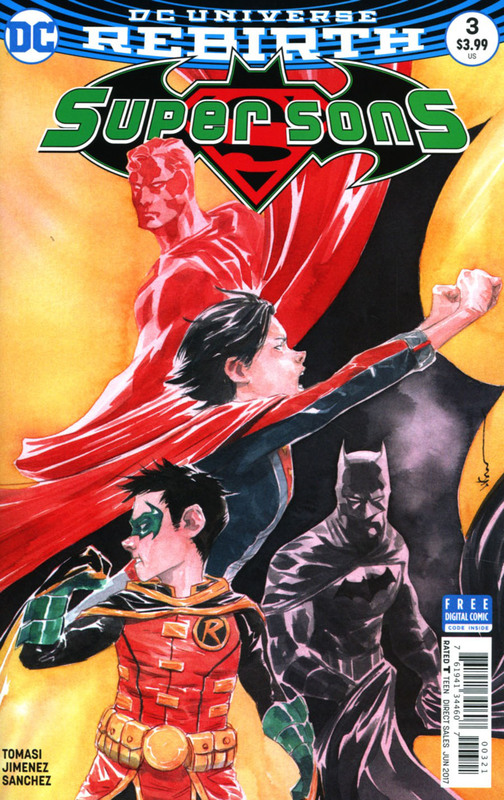 In the present, Superboy is attacked by Batman in the woods, while Robin is thrown around by Superman at the warehouse they came across last week. During the fight, the boys both realize that they are fighting robots rather than the actual Superman and Batman. During the battle the boys are brought together, and almost immediately begin to argue with one another, making the robots lower their guard, as they attack and try to take them down. Proving unsuccessful, Kid Amazo's sister, whom Superboy came across earlier, orders the robots to "stop" and "put them down". She explains that she can control machines, and the boys head back to the warehouse with her in tow. Meanwhile the two robots acting as Superman and Batman, fall apart, and reassemble to become versions of Jon and Damien. Amazo's sister explains Kid Amazo's powers, and explains what she's been through because of her brother. The boys begin to argue once again, as Amazo's sister appears to get possessed by her brother. She explains that she too is a robot, and that she managed to wrestle control of the robot form because of her powers. She tells the boys that she is an Amazo-Bot with her personality and her family are safe for now, but fears that her brother will kill them for real soon, if he so chooses. We end with the boys overwhelmed by many Amazo-Bot versions of Superboy and Robin. As they seem to be on the losing end of the battle. Story - 5: Tomasi delivers yet another action packed issue this month, with a lot of explanations of the behind the scenes happenings in the story. 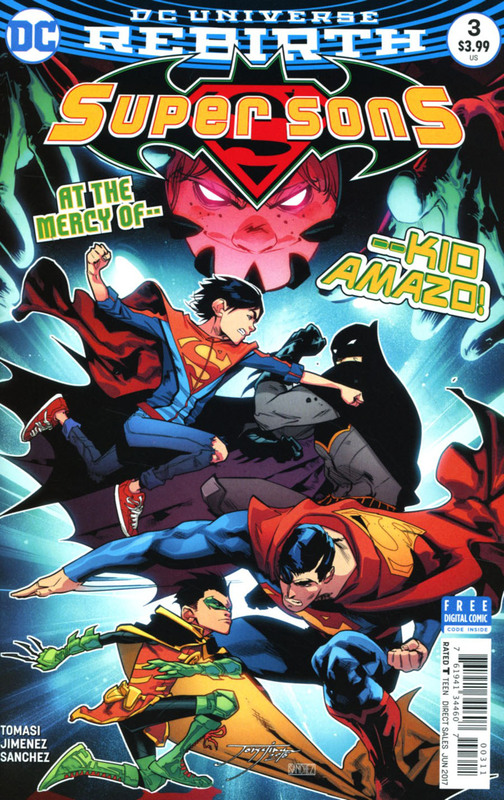 During my review of issue #2 last month, I said that Kid Amazo murdering his family was a little dark, especially for a book that revolves around two young boys of the age of 10 and 13. Well, it appears that I jumped the gun on my critique, as Tomasi already had it planned, that they were all robots or rather Amazo's assimilating the guise of his parents and siblings. Very clever twist there Mr Tomasi, I commend you for tricking us into thinking that something truly horrific happened and our young heroes came across it. I'm enjoying the way this book is paced, because the predicament the boys are in right now is what kicked the book off in issue #1. I like the way Tomasi is peppering in the details of the past as the story progresses. As I mentioned before, it was good to learn that Kid Amazo hadn't in fact murdered his entire family. Also it was nice to learn that each member of the Duffy family possessed different individual powers. It gives them a lot more depth, and makes you care for them a little more. The Amazo-Bots even make a lot of sense, and are a great plot devise for the boys to really cut loose and showcase their power and skill. The best part for me this issue was the banter between the boys. There seems to almost be a sibling rivalry between them, making the title of the story aptly named. Damien is a condescending jerk, and is quite evident that he likes to get into Jon's head. Bringing up the Teen Titans a couple of times really solidified the fact he loves to lord his age over Jon. But Jon is no slouch either. I like that he makes Damien acknowledge, he has no powers and that Damien was the one that dragged him into all this mess. That Damien chose him, over a whole team full of teenage heroes. I have read Tomasi's Jon Kent over in the Superman title since the start of the whole DC Rebirth line, I feel that he really has a great grasp of who Jon is, and manages to write him in a distinct manner, giving him his own voice. With his previous experience writing Damien also, I can't think of anybody better to tackle these two boys! Great series so far, can't recommend it enough! Art - 5: Jorge Jimenez... He is one of my personal top 3 artists, working at DC right now. I absolutely love what he brings to each page. Such kinetic energy bursting from each scene, sometimes I forget that I am reading a comic, and not watching animation. Seamless flow of the narrative from one panel to the next, if WB Animation decided to ever adapt these stories for their direct to video movies, I hope that they mimic Jimenez style. I know that the great and awesome Phil Bourassa is the lead designer over there, but just for one movie, I'd like to see Jimenez style bought to life. Just as Tomasi has found the voices of Jon and Damien, Jimenez as managed to capture their look, and got it mastered down to a T! In no panel or page do the character models change, and seem off or wonky. So when coupled with Tomasi's dialogue, you feel as if the Jon and Damien have come to life on the page. The most exciting part is the banter and arguments this issue, as Jimenez manages to portray the annoyances and frustration of the boys with one another and the situation they are stuck in. I love that they are literally at each other's throats. Now I'm not sure what has happened to Titano since the New 52, and why he is a cyber-gorilla, but he looked really awesome on the opening page. Also I liked the sass that Kid Amazo's sister portrayed when she commands the Amazo-Bots to obey her. That was a nice touch by Jimenez. I love the body language of all the characters in the book, it evokes so much personality. Also it's worth keeping in mind that the events of this arc take place prior to the Superman Reborn arc, so it makes sense that he is still in his rebirth costume with the blue boots and red belt. With all that said and done, again, the art is elevated to a whole new level with Alejandro Sanchez colors. Each page and panel becomes so vivid and full of life, it invites you into the story. One important note I made regarding the coloring was, notice that the sun is now rising. Meaning that it's now dawn, and the boys have been at it all night. I can only imagine what Lois and Clark will do when they go to Jon's room to wake him, and find him missing. All this, just from the coloring, this book really is a masterpiece! Cover Art - 5: The boys take on their dads this month for the cover. What I love best, is the fact that the cover actually depicts what happens this issue. Also I love that Jimenez Superman has a Jose Luis Garcia Lopez feel to him a little.